Born and raised in the San Francisco Bay Area, Chef Matt Smith learned at an early age that food was in his blood. At age 8, he started cooking the family Thanksgiving dinner. 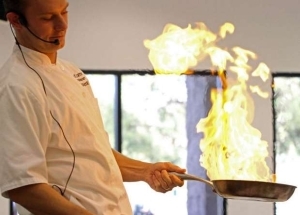 After graduating high school, he attended San Diego State University and attained a Business Management degree, following the advice of his favorite local chefs. Upon completion, he moved backed to the bay area to work at Farallon, one of San Francisco’s seafood landmarks. After saving up money, he left for France and attended the famous Le Cordon Bleu Culinary School in Paris. While in Europe, he had the opportunity to work at the world famous Taillevent (Michelin 3 star) and Cantine Gourmet (Michelin 1 Star) in Paris. Then he staged at Martin Berasategui (Michelin 3 Star) in San Sebastian, Spain. He also traveled through Italy, Brussels, and London, experiencing everything each cuisine had to offer. After he returned to the states, he worked at Nine-Ten, in La Jolla, under the direction of Chef Jason Knibb (a 2010 Rising Star Chef winner) and pastry Chef Jack Fisher (San Diego’s 2010 Best Chocolatier). He then left to be part of the grand opening of Paradise Grille in Del Mar, California, as the opening Sous Chef and was later promoted to Chef de Cuisine. He reunited with Chef Christian Graves (formerly of Farallon) as Sous Chef of the Hotel Solamar and JSIX Restaurant in downtown San Diego. Matt implemented a charcuterie program and built a downtown rooftop garden on property. After his time at JSIX, Matt moved on to the La Jolla landmark, La Valencia Hotel, as Sous Chef for its four restaurants. Soon after, Matt was given the opportunity to be the Executive Chef at the Winesellar and Brasserie. The Winesellar and Brasserie is a Grand Spectator Award winner and has been consistently rated as one of the top restaurants in San Diego over the last 20 years. While working there, he met Ed Moore, owner of the 3rd Corner. Matt was then recruited to be the opening chef of his third restaurant in Palm Desert. The 3rd Corner, Wine Shop and Bistro, quickly became one of Palm Desert’s most popular restaurants. Most recently, Matt jumped at the opportunity to relocate to Northern Colorado. He looks forward to being a part of the emerging food scene and hopes to develop it further at Door 222 Food and Drink. Chef Matt has been with Door 222 since May 2014.